This Prayer for Mary’s Third Sorrow above, like the First, covers the flipside of a Joyful Mystery of the Rosary. The Finding of Jesus in the Temple becomes the Loss of Jesus instead! For those of you not familiar with the story we have this this scriptural reference which we will sum up here. Jesus went with Mary and His foster-father, her husband Joseph, to Jerusalem to celebrate Passover when He was 12. When Mary and Joseph departed afterwards, they found, much to their shock and dismay, that He was missing from the caravan of people heading back home! Jesus had stayed behind in Jerusalem. 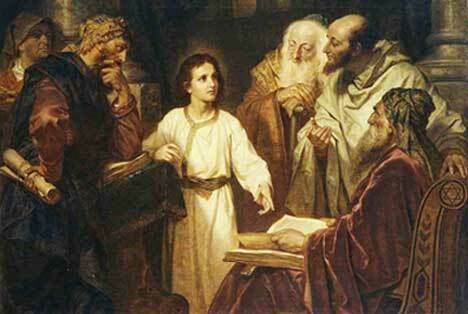 After searching for three days, they finally found Him engaging in a spirited discussion with the learned teachers in the Temple, as shown in this painting above. No wonder this event is also a Rosary mystery. It certainly seems mystifying! “Why would Jesus do such a thing?” you might wonder. Perhaps He was drawing a clear distinction between His divinity and His humanity here, to point out His need to serve His Heavenly Father, as well as His Holy Family. Remember, in any case, that God's ways are not our ways, as the prophet Isaiah noted (Isaiah 55:8). He loves us in ways beyond imagining. (Look at a crucifix next time you doubt this and remember He died to save you!) Yet, our Lord can seem distant or hidden from us at times. Think of Jesus' own words from the cross spoken to His Father, quoting from Psalm 22 “My God, my God, why have You abandoned Me?” (Matt 27:46). Saints have gone through extended “dry spells” when they felt God wasn’t near them at all. St. John of the Cross in the 16th century wrote of the “Dark Night of the Soul” he experienced, for example. In this Third Sorrow Mary experienced a special kind of pain in that she had no idea where Jesus was, or more importantly why He had left her. In her great humility, St. Alphonsus Liguori wondered, she might have thought that He’d left her because of some negligence on her part! God hasn't left us in our spiritual dryness or darkness, however, anymore than He abandoned His Holy Family by staying in Jerusalem. He tries to strengthen our faith in such moments by having us trust in Him in the midst of our anguish. After all, the only way we can really lose God is by willfully living a sinful life with no contrition, especially when we’ve committed mortal sins. Sin is what separates the soul from God. Even then, though, no matter what we’ve done, His door, and His heart, is still open to us through the sacrament of Penance. Prayer can help us enormously. It allows us to turn to God with a loving and contrite heart, and not away from Him in anger or discouragement in the grief-stricken moments in our lives. Bishop Fulton J. Sheen summed up our Blessed Mother’s situation in this Third Sorrow nicely when he wrote “Sin is the Loss of Jesus, and since Mary felt the sting of His absence she could understand the gnawing heart of every sinner and be to it, in the truest sense of the words, ‘the refuge of sinners’”. He further noted that “Mary lost Jesus only in mystical darkness of the soul, not in the moral blackness of an evil heart. Her loss was a veiling of His face, not a flight. But she does teach us that, when we lose God, we must not wait for Him to come back. We must go out in search of Him; and, to the joy of every sinner, she knows where He can be found!” Don't ever be afraid to ask Mary for her help and grace when you feel like you're in a “dry spell,” or have otherwise “lost” our Lord!